Posted On Mon, 08 May 2006 06:15:00 +0000. Filed in mountaineering. By Vaibhav Bhandari. TheBaricade Originally uploaded by vbha. This weekend I enjoyed amazing time overnight blacier climbing around stevens pass. I learnt some basic techiques for glacier climbing like stepping, using the ice axe, demo of cravasse rescue and knowing snow you are climbing on. Here are picture of the trip by rockymountain. In this picture I’m standing next the bunker tent myself and David (my tent-mate) made up with advice and help from Rayner (our trip leader). 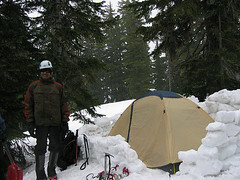 This was the first time I camped in snow. Tricks like putting snow between raincover and tent to form an insulating layer, assiting tent access using feet hole and building a brick baricade around tent for protecting - are some of the things we learnt with this.